OK, this is the cover of a children’s book and accuracy isn’t necessarily a high point and what I’m looking at is not obvious unless you know what to look for so here’s another painting with the same issue. 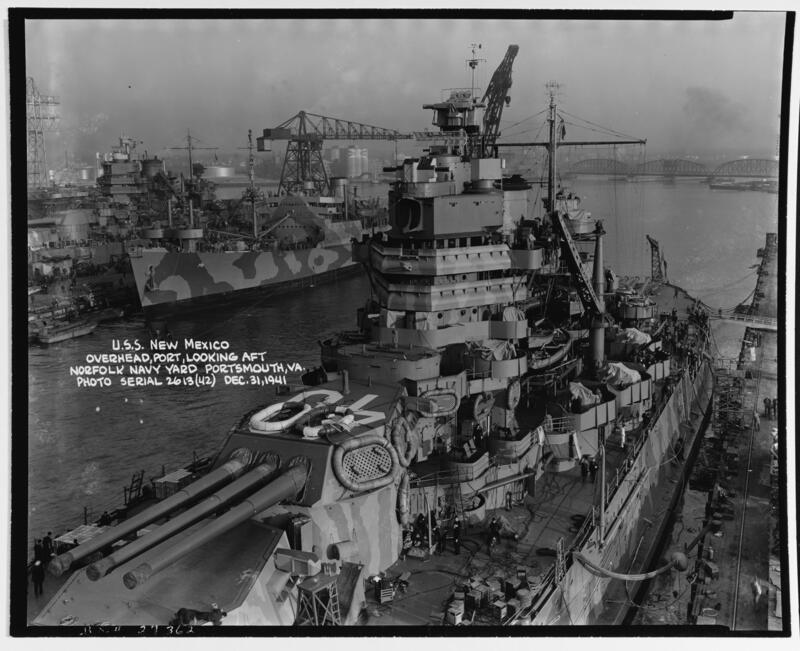 I could find numerous examples of battleship paintings with the same issue. Here’s a painting of the Bismarck. This page shows what I’m talking about. This painting of the Bismarck is correct. 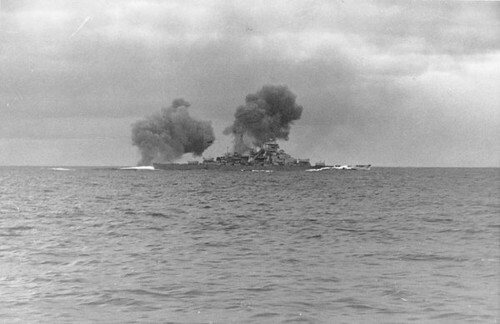 Here’s a picture of the Bismarck actually shooting at the Hood and Prince Of Wales in the Battle of The Denmark Sea. This picture is interesting because it shows a battleship’s main battery in action. While the picture is small and low resolution it’s a perfect example of why the paintings are in error. You can see the Bismarck’s main battery trained over the port side toward the Hood and Prince of Wales and just above the conning tower you can see the Bismarck’s main battery director pointed exactly where it should be, in the direction of the target, unlike the paintings where the director is pointe directly forward. The issue I have with the earlier paintings is that in all of them the main battery directors are pointed directly ahead while the guns are trained over the side. Which would almost never be the case in reality. This can be seen in all too many paintings and illustrations of battleships. I think that the reason this happens is that pictures of battleships in action or firing at targets are rare and models of battleships are easily obtainable. The problem is that the typical battleship model kit does not have a director that rotates. In fact the only warship model kit that I can remember having the director that rotated with the guns was Lindberg’s destroyer kit. In any case the director, being yet another fragile part is typically glued straight ahead while the main battery, in turrets which are on pins are free to rotate. So it’s easy to pose the guns point over side for photographs, but the director will be pointed straight forward as it was glued. This is understandable because the director, especially in WW2 ships has a lot of fragile structures like radar antennae and the rangefinder horns. Also. the director is much smaller than the gun turrets and usually close to other fragile structures like masts and radar or radio antennae. So on the typical model you are just better off gluing the director and not playing around with it. Note how much longer the barrels of the guns are. Now this presented a problem in all the world’s navies. They were shooting a lot of steel at targets and hitting mostly water. This gets very expensive very quickly. The problem was that what had been a great big ship when up close at a couple of hundred yards was now a small dot on the horizon and might not be visible from the deck. There’s also the problem of predicting where the target would be when the shell got there. This was the gunnery problem. The gunnery problem had three parts. the first was rangefinding. The second was computing the rate of change of the target’s range and the third was actually coordinating the fire. If all of these things work, the shell lands on the target. Getting to this point was a lot of invention, effort and fighting against Admiralty establishments. 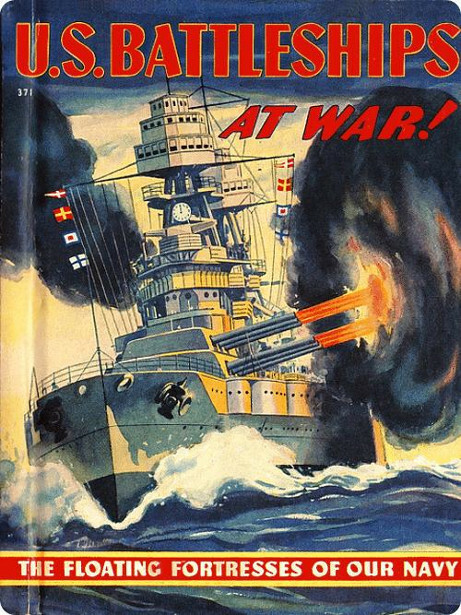 Here’s a pile of links with discussions of the history and technical details of battleship fire control. Just scanning the links, I learned quite a bit about a very technical subject. Here’s my previous post on battleships and fire control. Here’s an excellent close up picture of the fire control tower of the USS New Mexico. And some pages from the Naval ordnance and gunnery manual. Here’s the USS Wisconsin firing her main battery. Same training exercise from the deck of the Missouri. Some references I found putting this post together. I hope that this post can give anybody wanting to what those little dohickeys on the sprues of models kits actually do. All that stuff on the towers and masts of a warship are there for a reason. If you paint or model ship, knowing those reasons and what that equipment actually does can take your work to the next level. Even if 90% of the people who see your work won’t know why things are the way they are, you will, and that’s the important thing.